The Plains of Abraham's history trace back to Abraham Martin (aka, the Scot) who was a friend of Samuel de Champlain and my 10th great grandfather. A pilot on the St. Lawrence and a high seas fisherman, he was apparently Canada’s first Pilote du Roi or 'Driver of the King'. 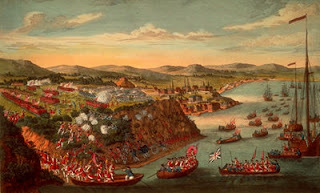 Accompanied by his wife, Marguerite Langlois, with whom he was to have nine children, he moved to Quebec City and in 1635 received 12 acres from the Company of New France. After his death in 1664, it was sold to the Ursulines.